Goswami Tulsidas, who was a great devotee of Lord Ram, wrote Hanuman Chalisa describing the greatnes of Lord Hanuman in Ramayana. It was written in ‘Awadhi‘ language during early 16th century and Chalisa word is derived from ‘Chalis‘, which means 40. 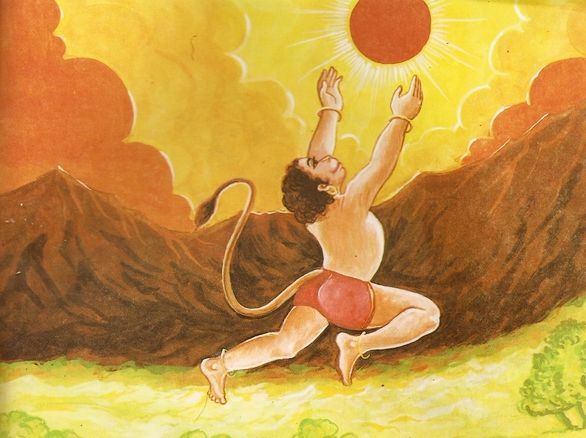 Hanuman Chalisa has 40 verses and in one line, it describes the approximate distance between Sun and Earth. You tried to swallow it (the Sun), thinking it to be a Sweet Fruit. Here, Yuga means the sum of Four Yugas (1 complete Mahayuga) with unit in divine years. So, 1 divine Yuga is 12,000 divine years. In Sanskrit, Sahasra means 1000 and 1 Yojana is equal to approximately 8 miles. So, 12,000 x 1000 x 8 = 96,000,000 miles. Recent calculations by scientists have derived that distance between Sun and Earth is 92,960,000 miles. Since earth rotates in an eliptical orbit around sun, this distance varies with seasons. In summer of northern hemisphere, earth is more closer to sun than in winter. Approximate distance between sun and earth was found by modern scientists in late 17th century and later, under the new definition, the astronomical unit (or AU) — the measurement used for the Earth-sun distance — is no longer always in flux, depending on the length of a day and other changing factors. It is now a fixed number: 149,597,870,700 meters, which is the equivalent of almost 92.956 million miles. Eratosthenes of Cyrene (Ancient Greek), was a Greek mathematician, geographer, poet, astronomer, and music theorist who lived between 276 BC – 194 BC. He was the first person to use the word “geography” in Greek and he invented the discipline of geography as we understand it. He was the first person to calculate the circumference of the earth by using a measuring system using stades, or the length of stadiums during that time period, and his calculation was remarkably accurate. He was the first to calculate the tilt of the Earth’s axis (also with remarkable accuracy). He may also have accurately calculated the distance from the earth to the sun and invented the leap day. Eusebius of Caesarea in his Preparatio Evangelica (written in 4th century AD) includes a brief chapter of three sentences on celestial distances (Book XV, Chapter 53). He states simply that Eratosthenes found the distance to the sun to be 804,000,000 stadia. Assuming one stadia is 185 to 190 meters, this is equal to 148.7 to 152.8 million km, which is approximately 92,000,000 miles ! He also mentions that Eratosthenes found distance to the moon from earth to be to be 780,000 stadia.